Participants, sponsors and planning committee members of the 2014 Northeast Regional Dairy Challenge. Laura Wilbur (right) of SUNY Cobleskill and teammate Devan Chirgwin (center) of University of New Hampshire take notes on the heifer facilities while evaluating Brook-Corner Holsteins in Lebanon, Pa.
Alayna Perkins (left) of University of New Hampshire and Brittany Mumbulo (right) of Morrisville State College measure stalls during a farm visit at the Northeast Regional Dairy Challenge. Students on Team 3 - Cargill, Inc. earned first place among teams evaluating Hess Dairy Farm, Inc. of Mount Joy, Pa. Front row (left to right): Samantha Simons, Vermont Technical College; Leah Caverly, University of New Hampshire. Back row (left to right): William Kreutter, Alfred State College; Brandon Grumbine, Penn State University; Tristan Peterson, Morrisville State College. 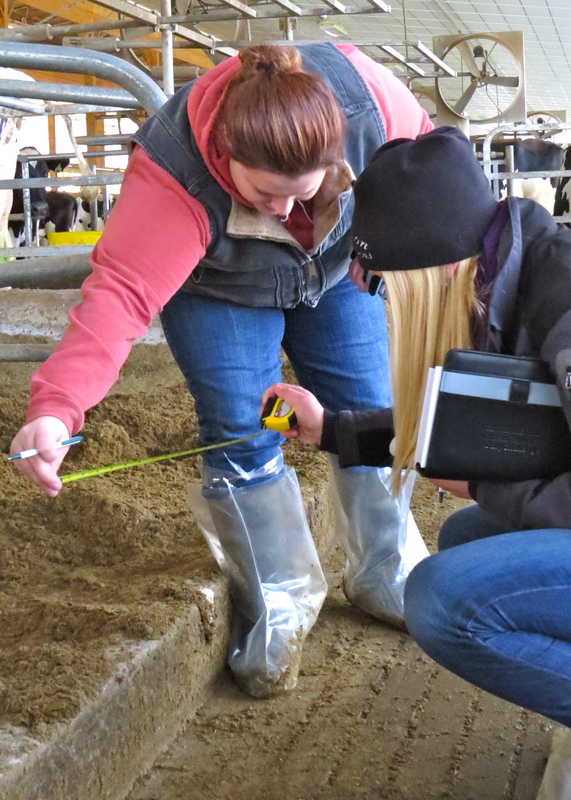 Students on Team 16 � Cows Come First earned first place among teams evaluating Brook-Corner Holsteins of Lebanon, Pa. Front row (left to right): Emily Fortin, University of Maine; Patricia Lefebvre, McGill University. Back row (left to right): Gearet FitzPatrick, Penn State University; Nicholas Mears, Alfred State College; Justin Hanehan, SUNY Cobleskill. Students on Team 19 � Holtz-Nelson Dairy Consultants, LLC earned first place among teams evaluating Furnace Hill Holsteins of Lebanon, Pa. Front row (left to right): Veronique Krohn, Morrisville State College; Rayne Paddock, Cornell University. Back row (left to right): Eduardo Carvajal, University of Connecticut; Daniel Laggis, University of New Hampshire; Louisa Barlett, Alfred State College.